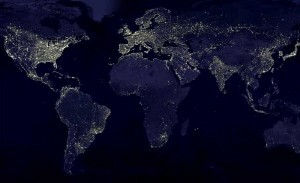 Most of us have seen those dark maps of the world where a satellite has photographed the earth at night from above. It's a beautiful image, all those tiny dots of light randomly sprawled across the continents; a dense series of sparkles where the major cities of the world lay, patchy where few humans dwell. Beautiful from atop indeed but we also all know what it's like to look up from where those lights shine into the dark sky and see... well... a glow from all that light permeating the darkness around us, so much so that we can't see the most striking and natural sparkles of this world - the stars!Of course we see a few in the city but when we're in the countryside it's a whole other kettle of fish - the entire galaxy shines before your very eyes. Light pollution can also affect wildlife. For example, artificial lighting can simulate a false dawn for some animals, disrupting their natural cycle and behaviours. It can disrupt plants growing patterns particularly those controlled by day length i.e. when leaves fall and flowers bloom. Both moth and turtle populations have diminished in areas where artificial nightlight has increased. When a baby turtle hatches they are distracted by the beachside resorts and away from the naturally moon lit ocean where they would normally be drawn. Humans too are at risk of a type of light pollution known as light trespass. Studies have shown exposure to light at night whilst sleeping (think street lamp shining through your bedroom window) could reduce the amount of melatonin your body produces. Melatonin is our body's main cancer fighting agent and a lack of it in our blood dramatically increases the risk of cancer. The good news is because of light pollution campaigns like the above the government is adding it to the list of statutory nuisances in the Environmental Protection Act 1990 so that people affected by light trespass will be able to take action. Also lighting designers, manufacturers, architects and others who have influence on our cities lights are creating lights which use only the energy absolutely necessary, are designed and fitted better and turn off when not required. The moral of the story - turn off the lights and help make our night skies light up the natural way. Every little bit helps.